If the employee's salary is less than $30,000 per year, replacing the person will cost you approximately 16 percent of the annual salary. Thus, a low-level worker earning $15,600 annually costs $2,496 to replace, while an employee earning $29,000 annually will cost $4,640 to replace. Replacing an employee earning between $30,000 and $50,000 will be even more expensive. The percentage increases to 20 percent, so replacing an employee earning $30,000 annually costs $6,000, replacing an employee earning $40,000 will set you back $8,000 and replacing an employee earning $50,000 will cost your company $10,000. If you think the above numbers are significant, they pale in comparison with the cost of replacing an executive. An executive who leaves your employ — whether voluntarily or involuntarily — will cost you about 213 percent of his or her annual salary. 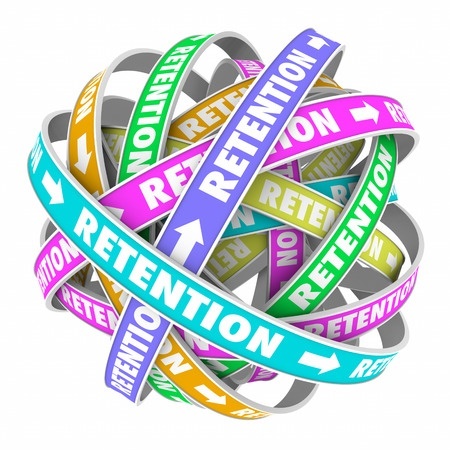 Many managers attempt to improve retention rates by offering higher salaries — and most of them are puzzled when the tactic does not work. Sure, money is important, but it is only one factor in employee satisfaction. In survey after survey, employees have stated that other factors are as important -- or even more important -- than salary. Employees value two-way communication, and they appreciate a feeling of engagement as much as your customers do. Employees want transparency from the company, but they also want you to express an interest in their career goals. Consider using performance reviews as an opportunity to learn more about each employee's career aspirations so that you can develop an individualized plan to help each person achieve his or her goals. After learning your employees' goals, you can evaluate how well their goals match up with your business goals, giving you opportunities to make your employees happy while simultaneously improving your chances of reaching your own goals. Most employees want to do a good job, and they expect you to provide them with the tools they need to do so. If you fail to meet their expectations, great harm can be done to the employee relationship. For example, if you replace a local legacy system with a radically different software, make sure that you budget the time and money to train users. Many of today's employees value ethics and social impact in the business for which they work. This type of employee wants to feel that their company is somehow benefiting the world as a whole, dealing with others in an honest manner, and complying with regulatory requirements. Offer in-house sessions to train employees on how to maintain compliance and on company policies regarding the treatment of employees, customers and the public. Employees value flexibility, especially if it can help them with their career goals. If possible, consider letting employees work a non-standard schedule to make it easier for them to take college classes. Conduct cross-training so that every employee knows more than one job, then offer opportunities for employees to trade jobs occasionally to keep current — and alleviate the monotony. Reduced turnover is only one of the benefits that you can reap from training and developing your workforce. You will likely find that your employees have increased motivation and improved morale, resulting in greater productivity. Happy employees also tend to be more creative and innovative. Changes in processes, methods and technologies will receive greater support from your employees and go more smoothly. Your succession planning can proceed in a more orderly, less uncertain manner. In short, workforce development is a win-win situation for everyone involved.